Having Rheumatoid Arthritis means we have a chronic disease that will never leave us or ever give us a break from its unrelenting effects that it’s releases on us. So for us to be able to make an attempt at a reasonable life, we are forced to take medications, try medications and deal with medications in hopes of getting a hold on this devastating disease. Taking medication for the majority of us is a daily in our lives just as this disease itself. We are forced to do this with the hope of finding relief from pain, stopping joint damage and in the long haul, maybe a chance at remission because we understand we will never be rid of RA. Is this a perilous journey we’re on; Yes It Is. You see taking the medication is just the beginning for us. The beginning of a struggle that makes some of us wonder “Is It Worth It”. We are getting ready for the battle with something that we feel can be helpful for us but in many ways can be and is harmful to us as well. This is the dilemma we face and this is the battle we are forced to fight if we want any chance at a hopeful life for ourselves even though our lives have been forever changed. Yes, we dread taking the medication but when it’s thoroughly thought out, what are our choices. Live without them and suffer the consequences or take them and deal with those consequences knowing that even with the side effects as bad as they may be, comes some hope for us. We learn to live with the ups and downs because it is what we have to do in order to salvage any sort of a doable life. So many of us have started this journey the same way and it has progressed the same for many of us. We all wish for and want to do better and feel better in our lives so this is why we suffer through the many different medications trying so hard to get it right. This is why we suffer with not being able to get out of bed, the nausea, the sweats, the rashes, irritations of many kind, more serious ailments, the brain fogs that scares us to death and plain and simply put, when the day comes to take that medication. We have to get our minds prepared and focused for what we know will be difficult days ahead. Some of us take pill forms and others have advanced on to biologics. Does this all sound a bit scary? I would definitely say it does, especially when we hear our doctors tell us about the side effects and we then further check other sources to see there are more horrible side effects listed that the doctor didn’t mention. Still written though are the hopes for making our symptoms better and this is what we fight for and cling to. That chance and ability to be able to function in a capacity that will allow us to have a life that is tolerable even with all that we go through. Believe me we all go through so many of those side effects from small to large. Note, there are many who struggle with the idea of not taking medicines but for each of us it is an individual choice. We all want the best for ourselves so we all must decide what that best is. We only want a life that can be what it once was but this disease has taken that by being what it is and by forcing its medications on us which brings with it so many terrible side effects. Our lives are forever changed by a disease that is relentless and medications that has no boundaries and in its own way can be almost as devastating. 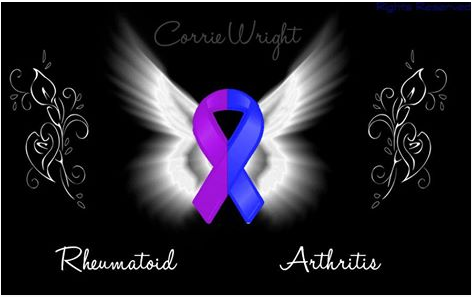 So for us Rheumatoid Arthritis is a disease that is attacking us in more ways than just being diagnosed with it. We have so much more to deal with than most realize. We are not just bound by this disease but by our medication as well. These 2 are our enemies and because we have one we are forced to take the other. We live with Rheumatoid Arthritis and there is no changing that so we must live with our medication and for most us, there is no changing that. I wish there were a better or easier way. Don’t we all, who suffer with a condition? Sometimes, when I get especially bitter, I worry that the medical field serves the almighty dollar more than it does its patients. What might a world be like where no one–doctor, scientist, pharmaceutical company, etc.–stood to profit off of advancements in the medical field? Where we helped one another with our conditions and disorders just because it’s a good thing to do, and we loved one another and helped one another like it was our job? Just thinking aloud. May be having a bit of a pain day doing the talking. You are exactly right. In the instance where people are charged 1000.00 per pill. Maybe it’s that way for the profit to keep us changing from one to another always dependent upon them for something new and even more expensive. Corrie, I found you via the ra support group online. I want you to know that I will be sharing your insight with my family and close friends. I really like your writing. Thank you. Hi Susan so glad that you stopped in on my blog. I hope that something here brings more understanding to those around you. Thank you for your support. God Bless. No problem I enjoy your comments. I know those of us with RA still forge onward in spite of. Thank you for your comment. That is so good to hear. Thank you for your comment.